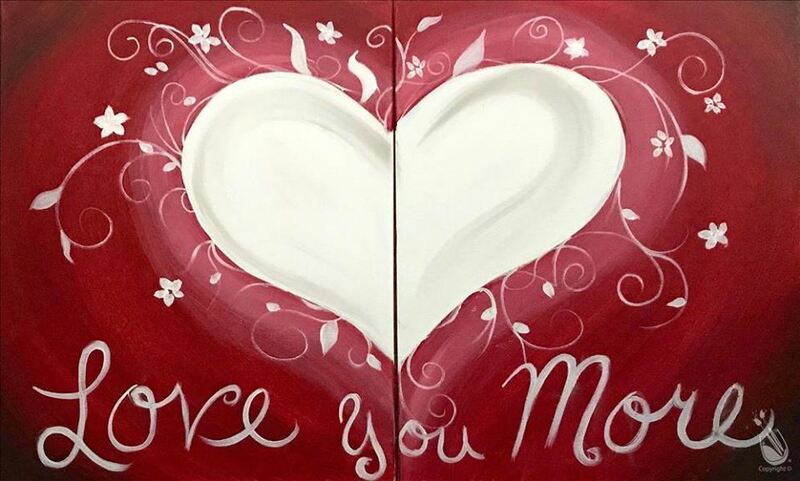 ***Online Registration Required*** Paint one canvas while your partner paints another - put them together to create the final image shown! We are located next to McAlister's Deli off Newberry Road by the Oaks Mall. Please arrive 15-20 minutes to get checked in, uncorked, and ready to go! BYOB! We provide cups, napkins, and paper plates. Please bring whatever food and drink you like! You must be at least 21 to consume alcohol in the studio. PAYMENT POLICY: To guarantee your seat, payment is due prior to class. If you choose not to pay online, please call 352-505-6778 or visit our studio for payment. Please call us if you are planning on paying day of – Walk-ins welcome, but these seats will not be guaranteed. We accept all forms of payment. Only paid painters are allowed in the studio during class. If you notify the studio more than 24 hours from the class, you may have a refund OR Store Credit. If you notify the studio LESS THAN 24 hours from the class, you will be issued a Store Credit. SEATING: Please let us know in the notes section who you want to sit with so we can seat you together and celebrate with you! Classes with little or no signups are subject to cancellation (3 or less will be cancelled, we require a minimum of 4 to run a class) or change in art. If you are interested in this class, please sign up early.